Course Duration: Master of Business Administration [MBA] (Systems Management) is 2 Years. Duration Course Duration of Master of Business Administration [MBA] (Systems Management) is 2 Years. 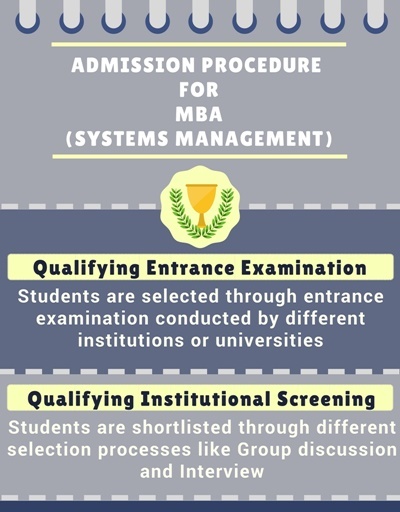 Similar Options of Study MBA (Marketing), MBA (Finance), MBA (Financial Management), MBA (Operations Management), MBA (Retail Management) etc. Employment Roles Web Developer, QA Specialist, Senior Test Analyst, Help Desk Team Leader, Technical Consultant, Business Process Analyst, Senior Systems Engineer, Financial Analyst, Administrative Manager etc. Placement Opportunities CGI Group Inc, EY (Ernst & Young), Accenture, HDFC Bank Pvt Ltd, HCL Technologies Ltd., Amazon.com Inc, Wipro Technologies Ltd., Genpact, Cognizant Technology Solutions Corp etc. 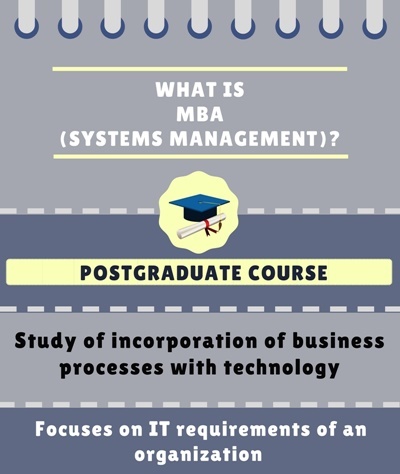 Master of Business Administration [MBA] in Systems Management is a postgraduate course. The duration of the course is two years and it opens many opportunities after its successful completion. It is a 2-year course which is divided into 4 semesters. The MBA operations apart from providing ideas and innovations regarding the management structure also focuses lights on the revenue generation and its capital importance assessment. The eligibility criteria for this course is to pass a bachelors degree in any discipline with a minimum of 50% and with no history of arrears from a recognized university/college. 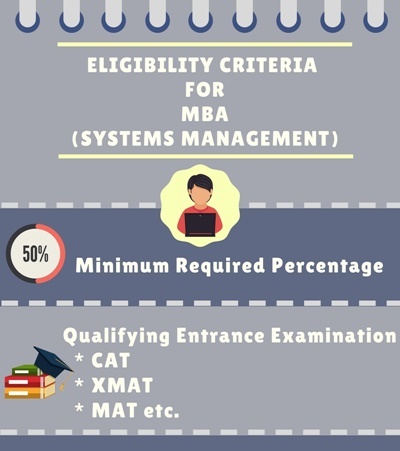 What is Master of Business [MBA] (Systems Management)? Systems Management is both technical and managerial in nature, essentially involving information management. The course is concerned with the incorporation of business processes with technology. The key skill is the understanding of various hardware and software platforms and the ability to determine the exact IT requirements of an organization based on its processes and manual systems. 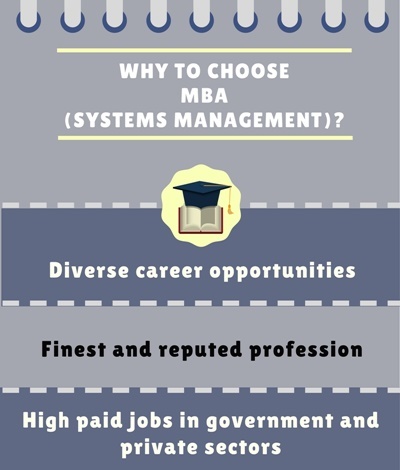 Why Choose Master of Business Administration [MBA] (System Management)? They can also go for further higher studies after its completion and can also become the teacher and lecturer after graduation. Candidates should have completed their Bachelor’s Degree from any recognized University with minimum 50% marks in aggregate or any other equivalent qualification. They should have critical thinking - using logic and reasoning to identify the strengths and weaknesses of alternative solutions, conclusions or approaches to problems. Applicants should have complex problem-solving skills like identifying complex problems and reviewing related information to develop and evaluate options and implement solutions. They must be a good time manager and be able to manage his own time and the time of others. Students should be good managers of financial resources also such as determining how the money will be spent to get the work done and accounting for these expenditures. The admission procedure may vary from institute to institute. One may apply through online or offline mode. The student should carry their originals and produce them during admission. One must provide all the details and submit the form within the deadlines. Some reputed institutes conduct their own entrance exams, in order to admit students into this course. There are colleges which provide direct admission to this course considering the marks scored in bachelors. Most of the institutes consider the scores of GMAT, CAT, XAT, MAT etc.